Memorial Fund staff went out Tuesday and took beautiful pictures of the Memorial after a winter storm that blew through most of the north east. We hope you enjoy the photos! As hundreds of thousands--even millions--of people jammed the Capitol grounds, the National Mall and Pennyslvania Avenue to witness the Inauguration of President Barack Obama, about a dozen people who couldn't get through the security checkpoint at 7th and D Streets, NW, paused in the NLEOMF Visitors Center to watch this historic moment unfold. The Visitors Center has no cable TV hookup nor a big plasma screen--only a modest laptop computer streaming CCN.com over a mostly reliable wireless network. But that didn't matter to the onlookers -- the jail psychologist with the Los Angeles County Sheriff's Department, two charter bus drivers, a family from the DC area and even a Washington Post reporter, among others. They watched with intensity and awe as President Obama took the oath of office and delivered his Inaugural address. As the throngs at the Capitol and on the Mall cheered the new President, so did the small group at the Visitors Center. As people there in person repeated "Amen" to the Rev. Joseph Lowery as he completed the benediction, so did the gathering at the Visitors Center. And as the millions on the Mall left with a sense of having witnessed a defining moment in American history, so did they folks at the Visitors Center. The NLEOMF salutes all of the law enforcement officers--federal, state and local--from across the country who are in Washington, DC, to ensure the safety and protection of everyone taking part in this, the 56th Presidential Inauguration. And in our hearts, as well as in a special exhibit at the Visitors Center, we pay special tribute to the 17 law enforcement officers who, throughout U.S. history, lost their lives protecting the President or, in some cases, Presidential candidates. Their honorable service in safeguarding our democracy will always be remembered on the National Law Enforcement Officers Memorial. "I am a police officer in Florida, and I am humbled to walk in the footsteps of so many brave men and women who have come before me. To all of you stay safe and always remember why you do what you do. We all have people who love us and want us home safe every night. Remember to never leave mad, always tell them you love them and watch out for eachother." The National Law Enforcement Officers Memorial Fund and our nation's law enforcement community have lost a long-time and valued friend. Former U.S. Senator Claiborne Pell died early on January 1; he was 90. 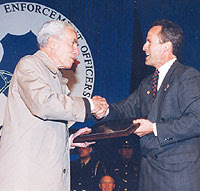 For his steadfast support, not just of the Memorial Fund but of law enforcement in general, Senator Pell received the NLEOMF’s inaugural Distinguished Service Award in 1996. His prominent role in establishing our organization and building the National Law Enforcement Officers Memorial will always be remembered.